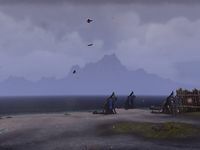 A grande ilha de Vvardenfell se localiza dentro do mar Interno e é cercada quase completamente por Morrowind continental, exceto pelo norte, que encontra o Mar dos Fantasmas. 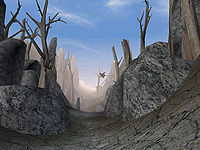 É um dos seis Distritos Imperiais da província de Morrowind. Tal distrito é dominado pelo grande vulcão, a Montanha Vermelha. Caracterizado por desertos de cinzas, planaltos rochosos e regiões úmidas costeiras preenchidas por flaura e flora incomuns. Durante o Ano Vermelho de 4E 5, Vvardenfell foi destruída após a queda do Ministério da Verdade ao se chocar com a cidade de Vivec, causando a erupção da Montanha Vermelha. A maior parte da ilha ficou coberta em cinzas, forçando a evacuação da população. Previously a Temple preserve under Imperial protection, Vvardenfell Territory was reorganized in 3E 414 as an Imperial Provincial District. Vvardenfell had been maintained as a preserve administrated by the Temple since the Treaty of the Armistice in 2E 896, and except for the independent Ashland tribes and a few Great House settlements sanctioned by the Temple, Vvardenfell was previously undeveloped. The region was host to large populations before the War of the First Council; few remained by the time of the reorganization, perhaps due to the Blight. When the centuries-old Temple ban on trade and settlement of Vvardenfell was revoked by King Llethan of Morrowind, a flood of Imperial colonists and Great House Dunmer came to Vvardenfell, expanding old settlements and building new ones. Local law became a mixture of House Law and Imperial Law in House Districts, jointly enforced by House guards and Legion guards, with Temple law and Imperial law enforced in the Temple district by Ordinators. The Temple was still recognized as the majority religion, but worship of the Nine Divines was protected by the legions and encouraged by Imperial cult missions. 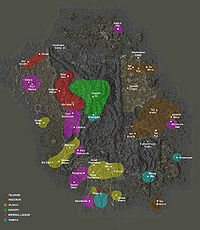 Created by the last giant eruption of Red Mountain, Vvardenfell has several regions: Ascadian Isles, Ashlands, Azura's Coast, Bitter Coast, Grazelands, Molag Amur, Red Mountain, Sheogorad, West Gash and Zafirbel Bay. The central and southeastern regions are mountainous wastes regularly scoured by ash storms. Esta página foi modificada pela última vez à(s) 19h03min de 3 de outubro de 2017.